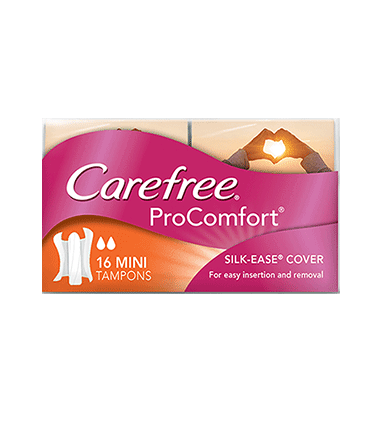 If you’re experiencing lighter flows or you’re trying tampons for the first time, try CAREFREE® PROCOMFORT® Mini Tampons. They are petite and have a unique SILK-EASE® cover that makes them much easier to insert and remove even on light days*, meaning you won’t have to miss spending time with your friends. They are designed with curved grooves to help absorb fluid fast to give you secure protection. A drop absorbency rating of 2 means they can absorb approximately 8g during a light flow.